So yesterday, Tom says to me, "I feel really bad, but I didn't get you anything for Mother's Day... not even a card." And in my head, I have two simultaneous pieces of internal dialogue. Ever since Sam was born, I'd wanted a cool piece of mother jewelry and just hadn't found the right piece. I was looking for something unusual, whimsical, but classy and just wasn't finding it. 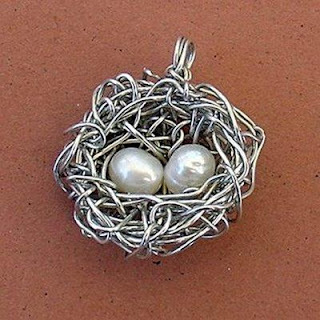 Then I saw this bird's nest with pearls representing each of your children and knew that it was the piece I was looking for. Yesterday it was on sale 50% off, and I mentioned it to Tom, hoping he would get the hint, but I got a man grunt in response (translation: why would I pay money so you can wear a bird's nest around your neck?). Existential questions like that would take far too long to answer, so I just went ahead and ordered it for myself. It would have been nice if Tom's gift giving radar had tuned in to my need for a bird's nest necklace and he had purchased it for me at the first opportunity and then surprised me with it over breakfast in bed on Sunday, but I live in the real world, and am married to a real man, who is sadly not attuned to my need for funky jewelry. That's okay. I won't hold it against him. He's a great dad, and thanks to him, I don't have to do it all myself. And really, I think Dads often get the short end of the stick when it comes to gratitude. Take Sam's pre-school, for instance. There is no pre-school in session during summer, so for Father's Day, they don't get a special program in their honor like the mother's do. On Thursday, Sam's preschool had a very nice catered brunch for us mothers, plus a concert where our children serendaded us with love songs and then gifted us with hand painted flower pots covered in fingerprint flowers. Earlier in the year, the school had Donuts for Dads day. Fathers were invited to bring their children to school, and in return, were served donuts and juice in the fellowship hall. There was no concert. No love fest (even though the kids were clearly ecstatic to have that time with their dads). It felt like an obvious bribe to get more paternal involvement. Tom has actually started coming home for lunch early and coming with me to pick up Sam because he loves the sight of Sam's lit up face when he enters Sam's classroom. That's a face that's usually reserved for the mothers who pick up in far greater proportion than fathers, so I'm glad Tom has discovered how important these small and seemingly insignificant actions are to Sam (and someday John). I am not the only one who needed this reminder, and the poem made us both rethink our reactions to the child we (not always affectionately) call Captain Chaos. Yes, he did take an entire roll of toilet paper this morning, wet it in the sink, and fashioned crude animal shapes from it, but you can't knock his creativity, his independence, and his adventurous spirit. He's going to grown up to be a fascinating man someday and Tom and I will feel honored and excited to be his parents then. It's just easy right now to forget that that day will be here before we know it, and we should enjoy his mini-adventures while we're still a part of them. In the same vein, I was reading older posts on my friend Kelly's blog, and came across her mention of a song called You're Gonna Miss This by Trace Adkins. I looked up the video on You Tube and after I saw it I was a complete boo-hooing, blubbering mess. Mother's Day isn't about cards, and flowers, and fancy, overpriced brunches once a year. It's about the change that happens when you take on the responsibility of one or more little souls. Like the bird who patiently builds a nest and then waits for her eggs to hatch, Tom and I both take every second as it comes, remembering this won't last forever, and someday our children will spread their wings and take flight. So which internal dialaogue did you vocalize? I probably would have gone with #1. But I also agree with #2 I'd much rather have time together or just get to sleep in than a card. Enjoy your necklace. There's nothing wrong with purchasing your own gift. I like that song and poem too. I should remind myself of it more often. Well, I read him my blog, so technically he heard both. :-P But at the time I didn't say either. I was too busy wrangling boys to comment. andrew took all three kids out later afternoon yesterday to buy cards, etc. the one he picked up for chloe was such a sentimental sweet, drippingly saccharined thing, but i found myself blubbering. the boys picked out one that said 'thanks for being the referee that kept us from killing each other.' whic was perfect, esp considering how the day started with them screaming at each other.